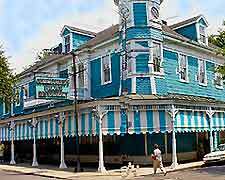 restaurants-guides.com - restaurants guide to Eating and drinking in New Orleans, restaurants guides to New Orleans, Louisiana, USA - Last updated 3/3/2016. Undoubtedly one of the highlights of a trip to New Orleans is experiencing some of the fine cuisine on offer in the city. Cajun and Creole cooking are the area's mainstay cuisines, with some of the top chefs in the world preparing delicious dishes here. The city's French heritage is also easily discernible from the numerous restaurants offering French cuisine and dining. Most restaurants are concentrated in the French Quarter, in particular on Bourbon street and around Jackson Square. Restaurants in the Warehouse district cater to an upscale business crowd and the Uptown district is a popular choice for students looking to dine affordably. Bars of all shapes, sizes and styles can be found throughout the city of New Orleans.